Just had my first Shakeaway of the year. Oreo Cookie and Custard. What better way to spend a Bank Holiday Monday than in fine company, walking along a windswept beach, bumping into random friends and playing beautiful music for the afternoon whilst drinking beer. Summer is here. Hoorah. Click for more timewasting game opportunities. it short, it's addictive, and it's shakeaway. I love it :D here's to the summer, end of exams, and beer in the sun! Im so jealous. 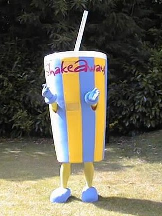 I used to live near a shakeaway down south but now up in the north there ain't none, not one single one! AAAARRRGGHHH! By the way terry's choc orange or fruit and nut when they don't overly blend it just leave choc in the bottom, mmmmm, slobber! what's bizarre is that you and Ali G (http://give-quiche-a-chance.blogspot.com/) are blogging in a similar way about the same day - was he one of the random friends you spoke about? Yeah, he was one of the randoms. (if that's not too harsh a word!) The fine company was Steph B and her milkshake of choice was cream egg and custard. It's clearly a case of great minds think alike going on!! hehe...when i come and see you kath its definately gonna have to be a shakeaway. never had one but you and ally have got me intrigued! Hey Kath. What a cool day that was all round. Great to see you in you natural surroundings! That was my first experience of Brighton and, man, what a great place. I went for the Banana and Nutella shake with added mistrels. Pure shakey goodness! More quotes to make you dance.